SNP tools is a general add-in for Microsoft Excel to do data conversion and basic analysis for Single Nucleotide Polymorphism (SNP) data. SNP tools enhances the ability of MS-Excel for genetic and epidemiological functions, such as the calculation of odds ratio (OR), confidence interval (CI), p-value, and power. SNP tools can convert your laboratorial data in Excel to the format of Haploview, Plink, Merlin, SNPHAP, Phase and PedPhase for the further analysis. SNP tools for MS-Excel can be used for MS-Excel 2000-2011 in MS-Windows 2000, XP, Vista, and Windows 7. The Mac OS X version for MS-Excel 2011 is also available. Important: You might need to adjust your security level to "Medium" in the table of "Security level" of "tools- Macro-Security" in Excel, if your system refuses to accept the Add-ins. In the new update version of SNP tools, a certificate was added by a digital signature, making installation friendlier. The medium security level arrows you to decide whether enable a "Enable" button in the window of "Security Warning". in the example data and formulas of some special built-in functions, mainly for strata data, which will input a rectangle range of cells. If you see the function is a cell like "='C:\Documents and Settings\bowang\Application Data\Microsoft\AddIns\SNP_tools.xla'!Strata_OR_CI95L(B4:E5)", please delete the prefix before '!' and set your function only the last part, i.e. "=Strata_OR_CI95L(B4:E5)", and hit ENTER key. If you see some cells like "#VALUE!" or "#WERT!" in the example file, you may need to refresh the calculation by double-click the cell and hit ENTER key. Some cells may show "######"m it means the column is not wide enough to show the long digits, change the width in the menu Format-->Column-->Width to set a long value to show all the cell value. We compiled the source code of SNPHAP for Linux in cygwin thus it can be run in DOS/MS-Windows. Here is the SNPHAP for DOS/MS-Windows and the cygwin dll. 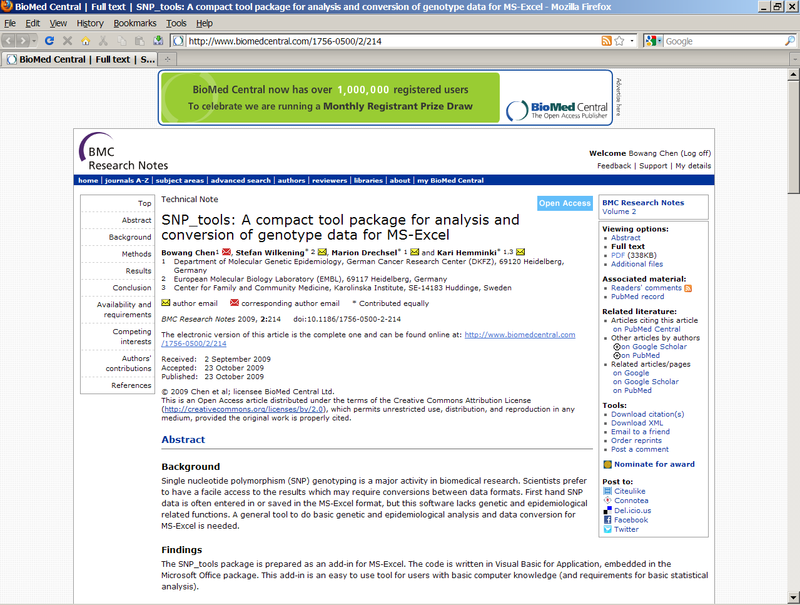 How to download genotype file from HAPMAP and convert into Haploview formats. Chen, B., et al., SNP_tools: A compact tool package for analysis and conversion of genotype data for MS-Excel. BMC Res Notes, 2009. 2(1): p. 214. SNP tools was mainly developed in Windows XP (Windows 2000) + MS-Excel 2003. It works well in Windows 7 and MS-Excel 2007 now. If any problems running in special platform, please feel free to let us know: c.bowang@dkfz.de or snptools@gmail.com.